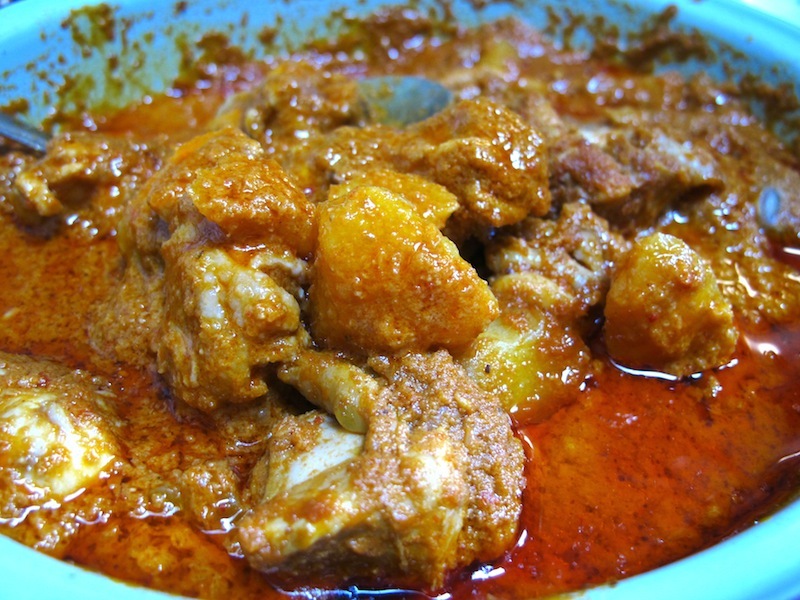 My aunt cook this chicken curry very often. I remember coming back from school with lots of delicious food laid on the dining table. I would always take a big serving of this with lots of curry covering my rice, and a tiny bit of other dishes like the less interesting vegetables on the side. She made it so well, the chicken is moist and tender, even someone teethless could savour it at ease. Pound or blend the spice paste ingredients into a fine paste. Heat some oil in the wok and saute cinnamon stick, star anise, cloves and curry leaves on low heat. Add in spice paste and stir fry until fragrant. Toss in the chicken, mix it around and let it cook for 5 minutes. Add water and cover wok with lid and let it braise until chicken is cooked. Now add the potatoes, coconut milk, salt and sugar. Mix well and let it simmer for about 20 minutes or until tender. Potatoes are added mid way so they do not break and become mash instead.